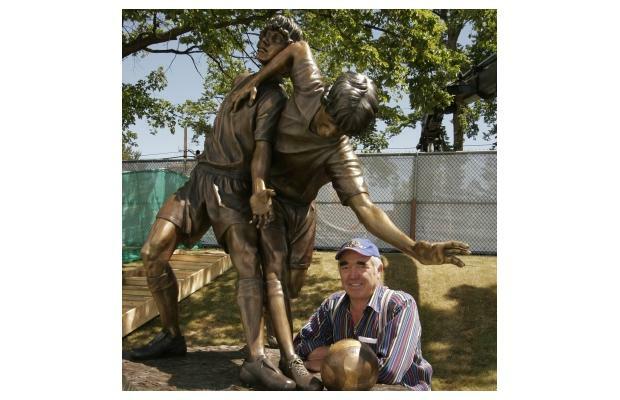 Armando Barbon's soccer sculpture is a family matter: The faces of the two young men chasing after a ball are those of his teenage grandchildren, while their bodies are modelled after his son. 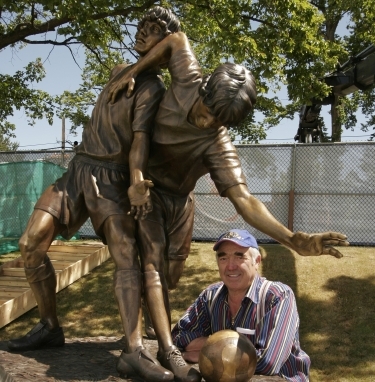 Unveiled last weekend at the players' entrance to Royal Athletic Park, the statue will remain on its large marble pedestal for the duration of the FIFA U-20 World Cup. "They are actually at battle, you see -- they're fighting each other for the ball. One guy had the ball and the other guy comes in and says, 'Hey, I got it,'" said Barbon, 69, who started sculpting eight years ago after a trip to Florence sparked memories of his long-forgotten dream of creating something with his hands. After the FIFA U-20 World Cup, the approximately 3,629 kilogram bronze statue, entitled "Battle on the Field," will likely be moved downtown for display at the mayor's request. Barbon said the statue would be lent to the city, although details haven't been worked out. A FIFA spokesman mentioned Centennial Square as a possible location. Although he started the statue with his grandkids in mind, Barbon said he's proud to dedicate it to the athletes of the World Cup. Barbon, who went to the real FIFA World Cup last summer in Germany with one of his grandchildren, said Japan is the team to watch this week. Barbon was a goalkeeper as a child in Italy, but played barefoot because his family couldn't afford shoes. He dropped the game to start work as a plumber. Emigrating to Canada as a young man, he started a deli in Victoria, which eventually turned into North Douglas Distributors. Now, as his 15- and 16-year-old grandchildren play for the Gorge Soccer Association, Barbon gets to enjoy the sport all over again. Barbon spent the last two and a half months, six hours a day, working on the sculpture. "I can stay there day and night to [sculpt]," said Barbon. The statue will eventually end up in the family garden at the request of his wife, according to Barbon.